This layered dip recipe uses several convenience products, however if you like, you could prepare homemade guacamole and salsa to use here. In a (7- x 11-inch) baking dish, and beginning with the guacamole, layer ingredients in the order listed above, ending with the olives on top. Cover tightly and chill in refrigerator for up to two (2) hours before serving with chips. For optimum flavor and appearance, use within twenty-four (24) hours. Since all guacamole turns brown when exposed to the air for more than about one (1) hour, and fat free sour cream starts to "weep" after just a little more time, this is a dish to assemble on the day you serve it. You need two cups (16-oz. / 453g) guacamole to cover the bottom of a (7- x 11-inch) dish. I have not used a larger flat dish yet. Click here for volume conversion chart via AllRecipes.com. Typically, I purchase a larger container of Wholly Guacamole® Classic dip at Costco. If you have 24-oz. total, go ahead and use it. 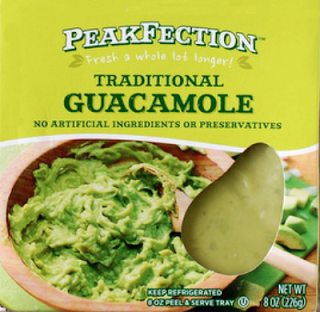 Occasionally I use and like Peakfection Traditional Guacamole which, according to the box, has no artificial ingredients or preservatives. I think 12-oz. sour cream is plenty for this (7- x 11-inch) dish; however, I used the entire carton rather than waste the surplus. You can halve the Daisy Light® Sour Cream 40-calories per serving (2 Tbsp / 30g each) to 20-calories, and the fat calories from 25g to zero by using fat free sour cream; I used the Kroger store brand for this comparison. Over the years, I've used a number of different tomato salsas in this recipe. My current favorite is another Kroger store brand, Private Selection® Chipotle Chili Pepper Salsa. Use what you like. In the batch photographed here, I used shredded mozzarella cheese; however, I prefer using finely shredded mozzarella (click here for photo).